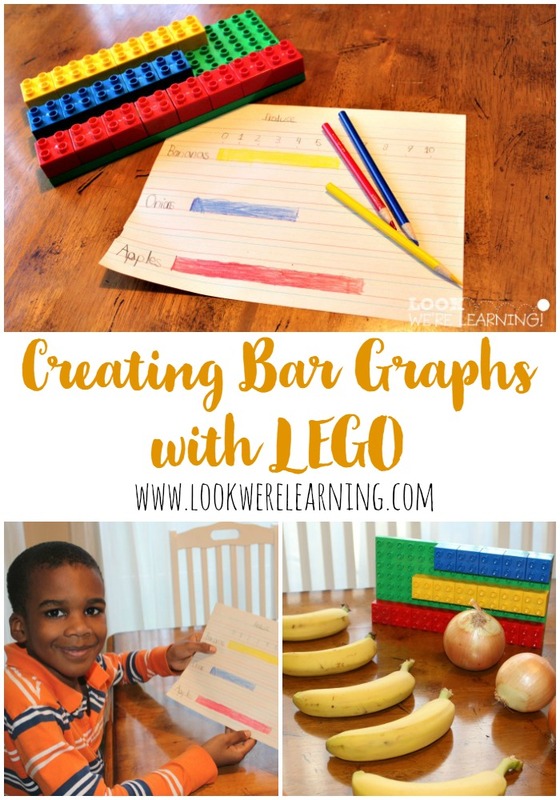 Lego Bar Graphs for 1st Grade - Look! We're Learning! 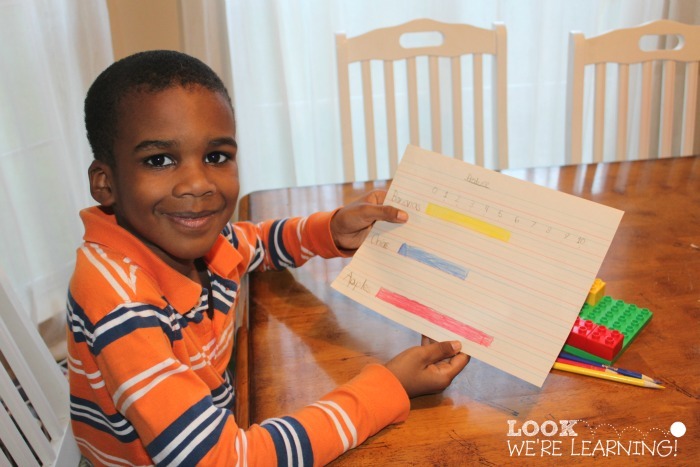 Roo is currently working his way through his first grade math objectives and it’s time to talk about reading and creating simple bar graphs. 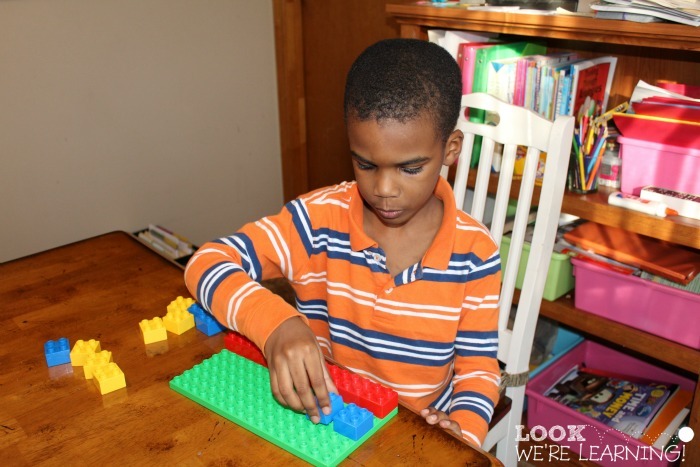 And what better way to learn just about any math skill than by using LEGO? 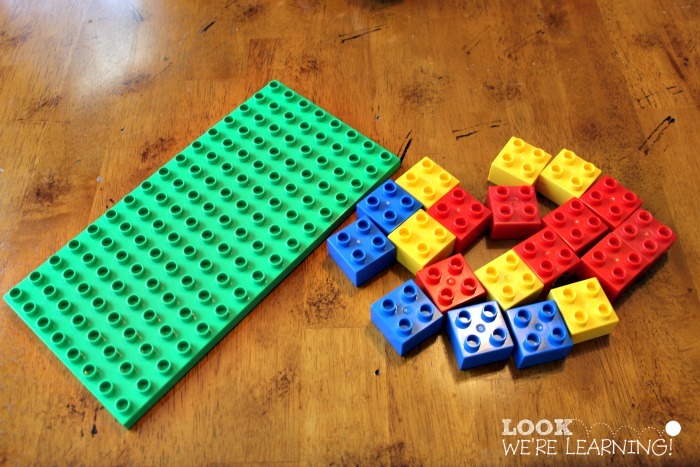 I’m joining up with the Early Elementary Blogging Team to share fun LEGO activities for kids in grades 1-3 today. 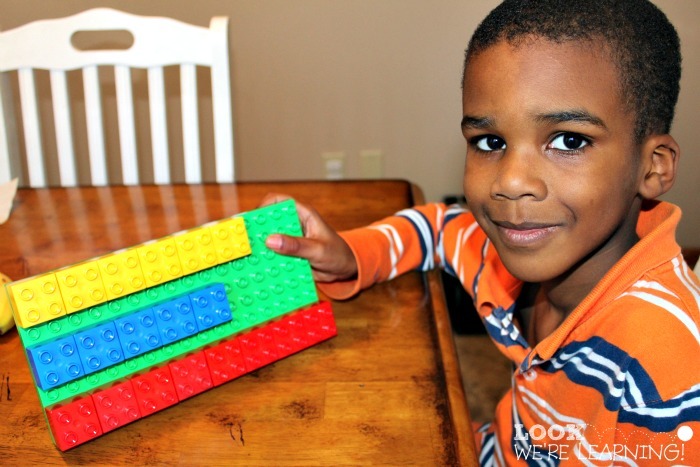 In our family, we learned how to construct LEGO Bar Graphs for 1st Grade! 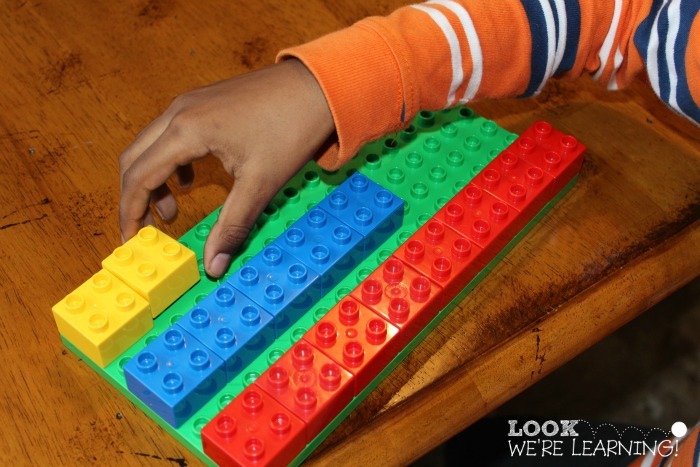 If you have a child who loves hands-on math, this is a simple and fun way to learn it! In first grade, kids work on reading and making simple bar graphs. 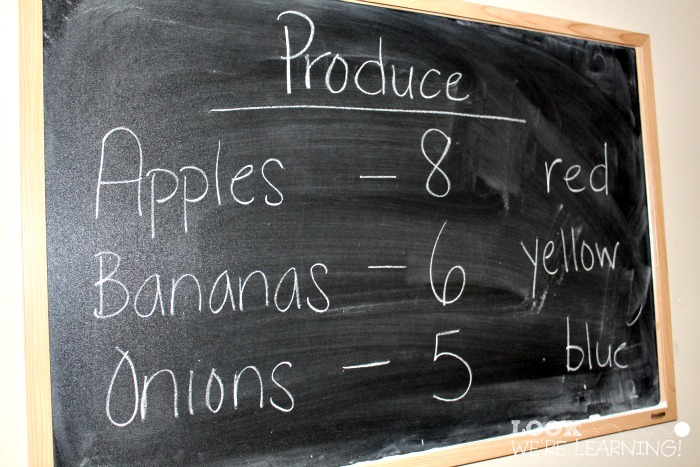 So, since we’d just gone to the store, I thought we’d collect data on the produce we currently had in the house. I really wanted to use oranges, but they were a little *ahem* expensive this week, so onions it is! First, I encouraged Roo to order all the objects he’d be representing. 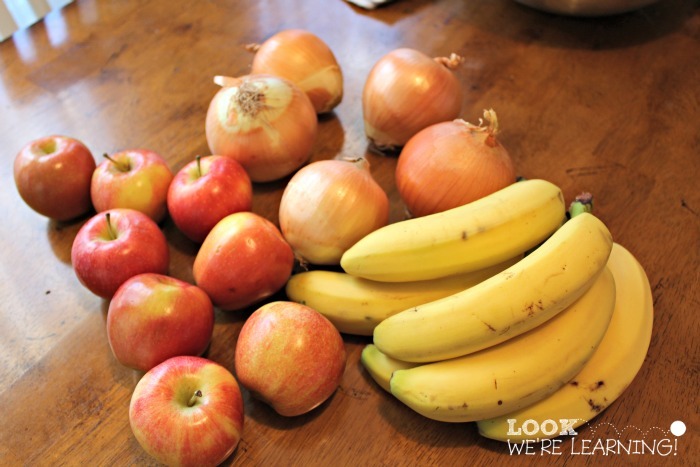 Apples in one row, onions in another, and bananas in a third row. 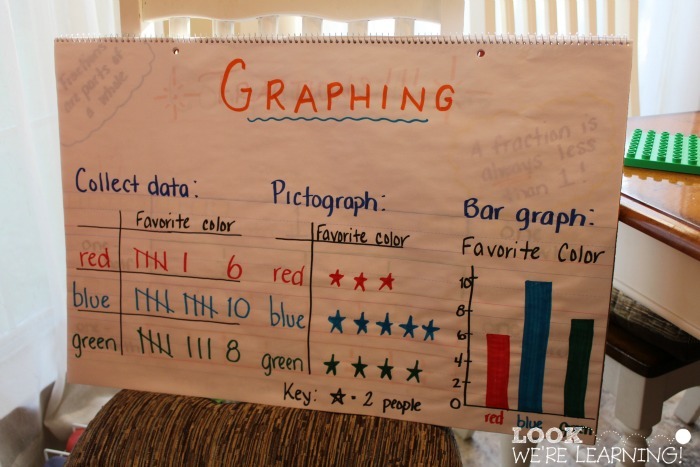 Then it was time to break out an anchor chart I’d made on graphing. Roo and I talked about how tally graphs, pictographs, and bar graphs were similar and different. 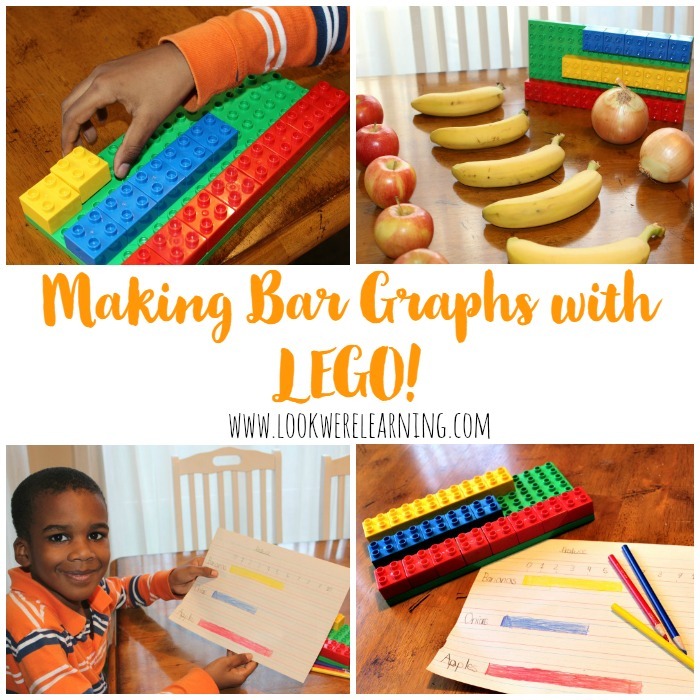 When he saw the bar graph, he said “Ohhhhh! I saw this before!” So we were starting out a little bit ahead. I asked Roo what Duplo colors he thought we should use for each item. We didn’t have white, so blue had to do for the onions. But we wrote down each item and the number of each, so that he could easily create his graph. So we got out the LEGO DUPLO Brick Set and got to work! Once he saw the anchor chart, he had a good idea of what to do. 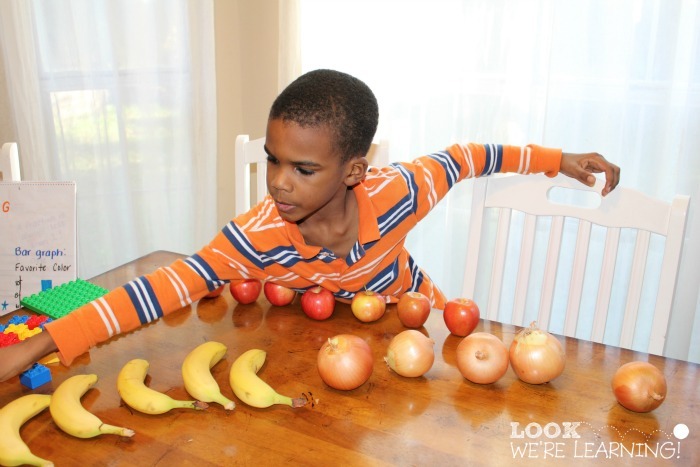 Apples at the bottom, onions in the center, and bananas on top – just like in his ordering sequence on the table. Sigh….order is lovely, isn’t it? 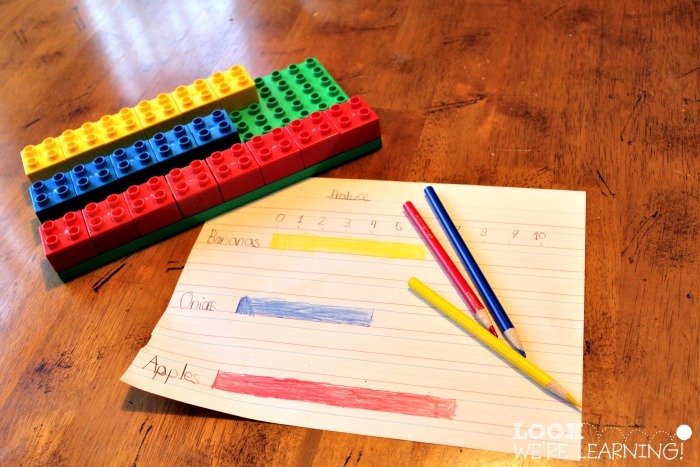 Then we used the LEGO bar graph as the model to draw one on paper. Roo labeled his data and started drawing. He took a few breaks to check his work as he drew. I love it when they look proud of their work! 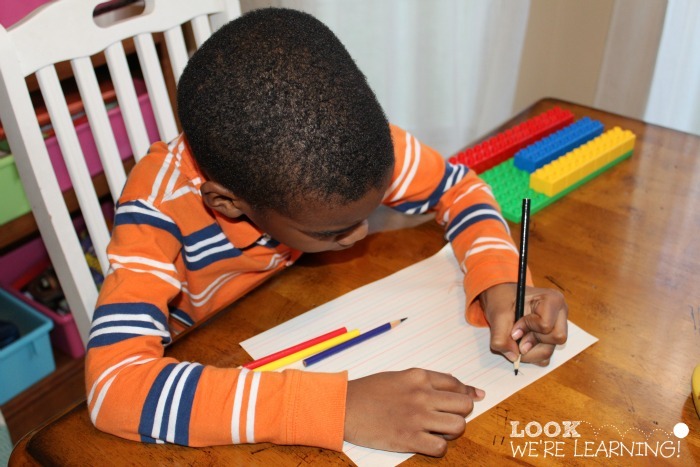 Interestingly, I noticed as I wrote this post that Roo has on the exact same shirt for the activity this week as the one we shared last Thursday. I promise he has more than one shirt! He’s just strangely loyal to this one right now. Go figure. 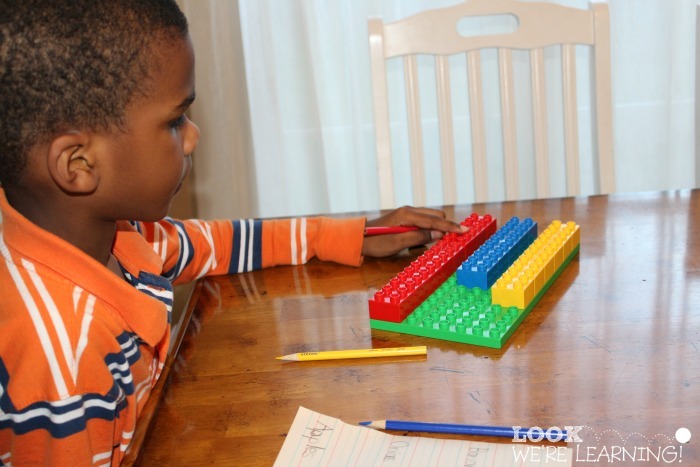 For more math ideas for kids, follow my Math Mania board on Pinterest! 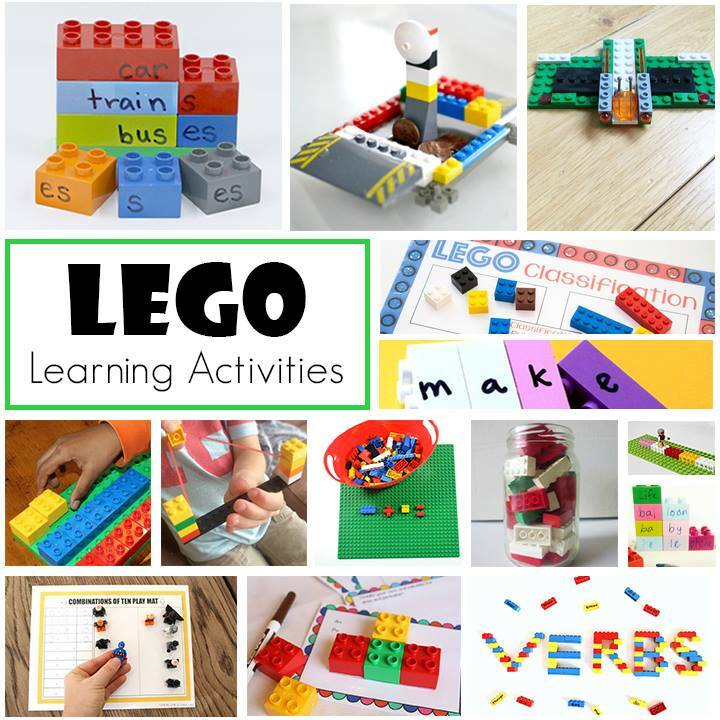 For more LEGO learning fun, check out the other activities from the Early Elementary Blogging Team this week! So much fun to graph at home! And Lego is the perfect tool for this. 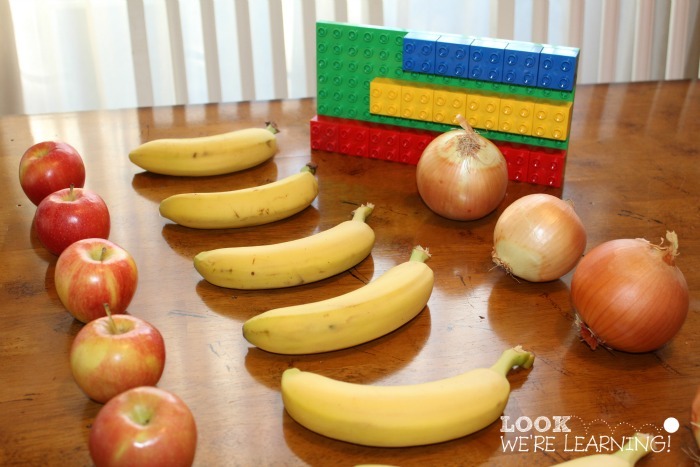 We love using our Legos for learning activities; we will need to try this one this week! Thanks for sharing! I use these type of things with my students and it really works 🙂 This past summer I had a girl who didn’t understand multiplication at all, and after doing creative things like this, she knew them inside out! Awesome!